Two Removable USB3.0 drive (“Bridge Pellet”) The NSB-25 ships with two removals USB3.0 drive module (diskless/2.5" specs). The Bridge Pellet is easily swappable with another one to expand storage space. *The Bridge Pellet modules required to add your own HDD or SSD disk). The NSB-25 with Sampler Pack ships with two pieces of user selectable Bridge Memory Module, available forSxS, XQD, 2.5” SATA HDD/SSD, CFast . 2K PlayBack & HDMI-Outplus Internal Speaker (Audio-out jack)The NSB-25 plays back 2K or preview 4K clips on 5" Colour TFT-LCD monitor on a bigger monitor through HDMI-out interface. Featured with internal speaker and stereo audio-out jack. Generate LOG file (CRC-protected)It can also generate a CRC (cyclic redundancy check) protected Log file to keep track of usage, and when copying an individual file that is 4GB or larger. 5" TFT-LCD 800 x 480 touchscreen and HDMI-out (v1.4)plus internal speaker/stereo audio out jack. 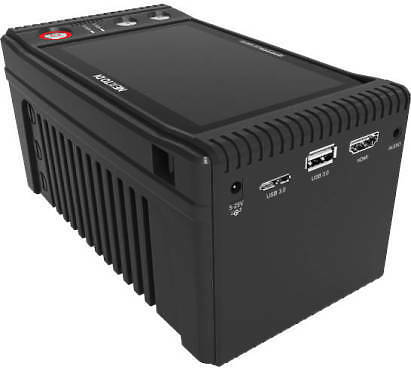 Hire the Nexto DI Storage Bridge NSB-25 from Procam. Best service and rental rates for the Nexto DI Storage Bridge NSB-25 and all cameras, lenses, sound, lighting and grip.